Finding the perfect venue for your wedding can be hard, but we can help! Tell us about your dream wedding and we&apos;ll take the stress out of finding the perfect venue. Contact us today! No wedding is complete without the guests, but where is everyone going to stay? Let us help you find the best room rates and accommodations for your guests. Contact us today! Whether you're a Colorado native or are planning your dream Denver wedding from 3,000 miles away, this website (and the knowledgeable VISIT DENVER staff) can assist you with a wide array of free Denver wedding planning services like finding a perfect venue or a getting the best rates on a hotel room block for out-of-town guests. Use this form to contact the many unique venues who can accommodate your perfect Denver wedding. 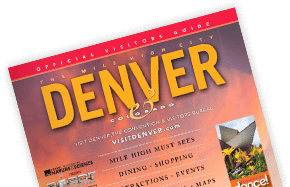 Allow the VISIT DENVER staff to assist in planning your guests stay in The Mile High City!